Get up close and very personal with the world's largest shark! Join the tour that won the Gold Medal for Best Adventure Tour in WA, and let Ningaloo Whaleshark Swim take you out into the big blue of the Ningaloo to experience wonder! Join the tour that won Gold Medal for Best Adventure Tour in WA. 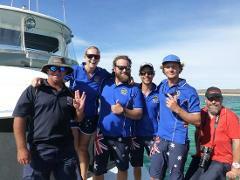 Come onboard and head out into the big blue of the Ningaloo to experience wonder interacting with whalesharks & whales, up very close and personal. 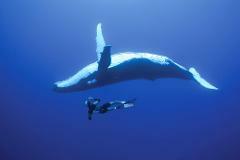 Experience awe & wonder and swim with a majestic, massive humpback whale - its an experience you will NEVER forget. Swim with Whalesharks or Manta Rays that our spotter plane finds during your cruise too! WONDER FULL! From Aug 1 to Sep 30. All our Whaleshark or Humpback Whale tours during your visit to Exmouth are fully booked? No problem! Select this option to easily book yourself onto the next best tour available. Buy a whaleshark tour gift voucher for someone very special and let Ningaloo Whaleshark Swim take them out into the big blue of the Ningaloo to experience wonder! Includes a full page photo pdf for you to print out and give them. Buy a gift voucher for someone very special to do something very special. 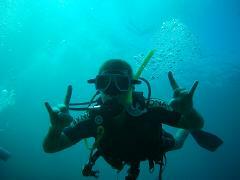 Let us take them out into the big blue of the Ningaloo to experience wonder up very close and personal! Includes a full page photo pdf to print out and give them. Don't just swim with a whaleshark, dive the Ningaloo Reef too! Our whaleshark & dive package offers certified divers 50% off a fun dive during your whaleshark tour AND ~10% off dives at Muiron Islands & Ningaloo Reef and Lighthouse Bay! Come help onboard our tour boat for a week. 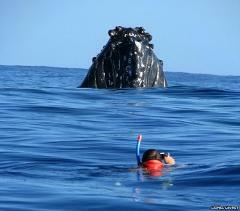 Swim with whalesharks or whales (if spaces available), dive & snorkel the Ningaloo. Experience real world marine tourism. $500 deposit secures your place, paid back in full when you finish.